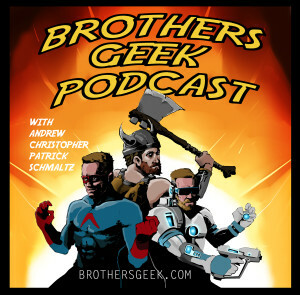 It’s a disciplined episode of the BrothersGeek this time around, we keep it under 90 minutes! With the holiday of Thanksgiving fast approaching each of us has something “geeky” to be thankful for. Only two of us are brought to tears, you will have to guess which two. Our collective noodles get baked by the sci-fi drama Arrival and we implore the Academy to recognize the wonderful work of Amy Adams. We remark on the familiar formula of Doctor Strange. Also, Westworld completely f*cks us up. Patrick and Andrew dive into Montress. It’s dark, violent and beautiful. Patrick reports on his Wrath of the Machine raid attempts in Destiny: Rise of Iron. All the Boys slog through the week of Iron Banner, mostly having a good time. Trivia is World War II movie themed. And it’s a challenge the Boys nearly conquer. This entry was posted in Podcasts and tagged Arrival, Destiny:Rise of Iron, Doctor Strange, Montress, Westworld on November 16, 2016 by BrothersGeekadmin.